The Joker is one of Batman’s greatest enemies and a foe of the character since the 40s. He has gone through many variations and many interpretations but one of the most revered and popular versions features is in The Killing Joke. This is a story by Alan Moore about Batman and The Joker having a brutal battle for Commissioner Gordon’s sanity and is interlinked with the tale of how The Joker became who he is. It is one of the best-selling stories in comic history and has been influential in the work of Tim Burton and Christopher Nolan’s respective Batman films. The Killing Joke is a look at Batman and The Joker’s relationship. It looks at how and why The Joker and Batman exist and why they, in The Joker’s words “need one another”. 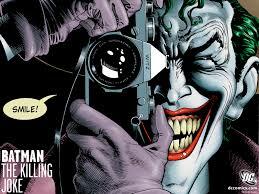 The Joker believes that without him there would be no Batman as The Joker feels his represents crime in Gotham. The implication being that Batman’s goal in life is to stop The Joker, this is an idea which Batman rejects throughout the story as he feels that as crime is more than just The Joker. However, he does accept that their volatile relationship will end in a dramatic way one way or the other, suggesting to The Joker that one way or another one of them is going to kill the other. The idea that Batman and The Joker are locked in an eternal battle is an undercurrent of most Batman stories featuring The Clown Prince of Crime but it is particularly evident here. It is a battle that The Joker is determined to win by proving that the best of men can be brought to his level; that the depravity, no matter how despicable can be committed by anyone if they have a bad enough day. This is reflected by The Joker in a sequence in which Batman chases him through a fun house exhibition. The Joker monologues to himself that he and Batman are more alike than Batman realizes. They both experienced one earth shattering event that changed their lives and sent them on their respective paths. The interesting thing is that while The Joker monologues over their similarities, he does not see their differences. He recognizes that both of them while remembering their tragedy every day, no matter what but he doesn’t seem to be able to understand that Batman has used tragedy in a positive way and uses his grief as a motivating tool, while The Joker has used his tragedy to inflict the same pain he felt onto other people. Moore’s depiction of The Joker’s backstory is similarly complex and detailed. The Joker was a failed comedian who ended up taking a mob job, dressing as The Red Hood a character used by gangsters in their raids. The Joker is depicted as a failed comedian which helps explain his modus operandi; the only way he can get people to laugh is using his trademark Joker gas which leaves his victims with permanent smiles on their faces – this way nobody cannot laugh at his jokes. Moore also fantastically depicts Commissioner Gordon. Though Gordon is imprisoned by The Joker and tortured both mentally and psychically, he pleads with Batman to take The Joker in “by the book”. Gordon knows that he can’t fall into the trap of revenge as that would make him as bad as The Joker. Gordon wants to prove that morality and justice work and that we can go above the tragedies we face and use them to do some good for others. Overall, The Killing Joke is a monumental story in Batman’s history as it takes a deep look at the core of Batman’s mythology. Moore manages to look at why readers enjoy Batman comics so much and personify it – the never ending battle between good and evil. In the next edition of The Dark Tales of The Dark Knight we look at Identity Crisis.